Featuring 50 stories of exploration over more than 200 years of human history, The Great Horizon is published in association with the Royal Scottish Geographical Society. The book features those who set out to conquer new territories and claim world records alongside those who contributed to our understanding of the world all but accidentally. 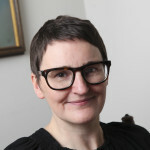 Author Jo Woolf reveals how working on the book led to her own exploration and adventure. In December 1913, when Sir Ernest Shackleton publicly announced his plans for the Endurance expedition to the Antarctic, he received nearly five thousand letters from hopeful applicants. Shortly afterwards, a friend noticed that these letters had been sorted into three large drawers in his desk, which he had labelled ‘Mad’, ‘Hopeless’ and ‘Possible’. Shackleton could only accept fifty of those applications, and it is tempting to wonder how many from each category were successful. I would love to believe those he considered ‘mad’ stood the best chance of all. When asked to imagine an explorer, we likely picture someone muffled in furs and battling Arctic winds, or perspiring in the heat as they hack their way through an equatorial jungle. Exploration seems to be a basic human instinct; the Phoenicians and ancient Greeks, the Romans, the Vikings and the Polynesians all set sail in a quest for new territory. This questing spirit is also seen in the European Age of Discovery which inspired Christopher Columbus, Vasco da Gama and Ferdinand Magellan. In more recent centuries, explorers such as James Cook, Mungo Park and John Franklin staked their lives – and lost them – in the great unknown. By the late nineteenth and early twentieth centuries, vast regions of the world still lay unexplored; there were, quite literally, blank spaces on the map. In the pure spirit of adventure, these attracted men and women whose curiosity spurred them to travel the unknown landscape, and tantalised the minds of scientists eager to expand and enhance their knowledge. Then there was political power; if a nation could plant a flag in these uncharted places, it could claim them as its own. Explorers often took on many roles, for example as scientists, cartographers, ethnographers, even negotiators and diplomats. Very often, therefore, their stories are linked with events in the wider world. In the late 1800s the ‘scramble for Africa’ saw European coun­tries vying to claim slices of the continent for trade; meanwhile the ‘Great Game’ was playing out in Central Asia, as Russia and Britain manoeuvred for power in the Himalayas. This is true even of more modern figures; Neil Armstrong’s first steps on the moon were argu­ably precipitated by the Cold War. Some found themselves especially drawn to those inhospitable parts of the globe where the extremes of climate made human survival all but impossible. The Arctic and the Antarctic captured the imagina­tion. The discovery of the Northwest and Northeast Passages opened up shorter routes for trading vessels, while the Antarctic was identi­fied as a vast continent. For a growing band of explorers, the ultimate prizes were the Poles. In more recent decades, our perception of exploration has under­gone a subtle change. The euphoria that greeted new ‘conquests’ in previous centuries has gradually been replaced by a sense of responsibility. As we begin to understand the absolute dependence of human life on the survival of our natural environment, the efforts of modern-day explorers are focused on enhancing our awareness and encouraging us to look ahead for the welfare of generations to come. Although Sir Patrick Geddes warned us that ‘environment and organism, place and people, are inseparable’ over a hundred years ago, we are only just beginning to appreciate the truth in his words. The experience of the explorer himself has changed, too. From the time when voyagers would bid goodbye to their families and head off into the great unknown, with absolutely no contact for several years at a time, we have progressed into an era of digital technology which allows instant communication and precise global positioning. Increasingly, the feeling that those early pioneers must have known is going to be lost to us: their vulnerability, their total isolation. It took nearly eleven months for the news of Scott’s death to reach the outside world. Admiral Teddy Evans, along with Tom Crean and William Lashly, was one of the last people to see him alive; as the two groups parted ways and Scott’s men headed towards the South Pole, Evans watched them until they became specks on the ‘great white horizon’. In 2014 I was invited to the headquarters of the Royal Scottish Geographical Society, to discuss writing about some of their medal recipients. The long list of names, stretching back to the late 1800s from the present day, reads like a Who’s Who of exploration. Alongside the ‘greats’ of Scott, Shackleton and Amundsen were some unfamiliar names that invited further investigation. From that point I set out on my own journey of exploration. 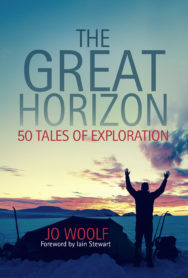 The Great Horizon: 50 Tales of Exploration by Jo Woolf is out now published by Sandstone Press priced £24.99.